Let’s file this one under “duh!” But for any remaining doubters on the environmental impact of reducing the number of cars on the road — this assumes you didn’t believe the reports of improved air quality and reduced noise on Paris’ car-free day last month. — the UCLA Fielding School of Public Health has research showing a similar, smaller-scale effect in L.A. In the air along streets that were closed to car traffic for the event, there was a 21 percent drop in ultrafine particles (associated with an increased risk for respiratory and cardiovascular disease) and a 49 percent drop in particulate matter, which has also been linked to respiratory and heart disease, as well as lung cancer and premature death. Streets that weren’t closed to cars but near the route also saw a 12 percent drop in ultrafine particles, the study said. Anecdotally, I can say there was something different about how downtown Los Angeles felt on Sunday morning as I walked along 7th Street. Naturally there was a very noticeable noise reduction, but also missing were the occasional whiffs of exhaust from the vehicles that would normally be idling at red lights along the street. The little known (and little enforced) L.A. law that makes locking a bike to a city parking meter illegal might be getting a makeover, according to KPCC. I can speak from experience that locking your bike to a meter is usually an option of last resort when there are no other places to secure a bike nearby. The practice was made illegal because of its potential to block meter fare collection and cause an “unsightly and chaotic setup.” However, the city’s transportation department last week passed a motion that will install 150 circular hitches on parking meters in Westwood to make securing bikes easier and legal. If all goes well, the hitches could be added to parking meters in other areas in L.A.
What’s not clear in the story are the specifics of the overhaul on the current law that makes parking bikes at meters illegal, like whether it will be completely wiped from the books or only modified to specify hitched-meters as legal bike parking space. Chicago transit blogger Yonah Freemark gets real in the wake of recent data showing the average vehicle miles traveled in the U.S. has increased after years of remaining flat. The plateau period has been mostly attributed to a generational shift caused by millennials’ penchant for walkable, transit accessible living. The basic facts of life on the ground in America—that our country is an automobile-oriented society—remain the case. Marginal changes in the way a new generation behaves, or even major changes in the way a new generation thinks, cannot overcome the realities of a country where more than three-fourths of jobs are located more than three miles from downtowns and where only one-fourth of homes are in places that their residents refer to as urban. One factor that might be clouding the perception and reality of increased transit use is that the major media and cultural centers are the top 10 U.S. transit cities, which account for approximately 47 percent of the nation’s transit users but only 7 percent of the workforce. But outside of the major cities, as the workforce has grown so has car use. But why? The growth in driving, again, should not be a huge surprise. Peoples’ lives are built around the environment in which they live, and that landscape changes slowly. Neighborhoods where it was hard to get around by anything but driving 20 years ago likely have remained that way and will continue to work as such for the next 20 years. And then there’s this graph, showing that despite a decline in younger people driving solo, it’s still the way the vast majority in all age groups get around. Freemark suggests that the only way to make a difference in how the majority of Americans get around — instead of just those in cities — requires developing a political argument that is backed by politicians and citizens, that is followed up with actual investment that change the way we fundamentally build our communities. It’s a solution easier said than done, of course. Warning: because it’s Gawker, there’s NSFW language. Though the subject of the article is disturbing — a blogger for SFist was verbally assaulted and threatened by an irate Uber driver — what I found most interesting is the comments section where readers have detailed similar experiences. Some say they’ve gone back to taking taxis because they feel safer or felt like the drivers were more competent. Others found the same trouble with taxis. As for Uber, the rideshare company apologized to the blogger and said they have since parted ways with the driver. The latest trailer for the new Star Wars opening was released yesterday and even if you’re not a huge Star Wars fan like myself, you have to appreciate the way it’s bringing the hype. Apparently after the trailer was released, tickets for opening night (December 18) have been selling out fast. So while you’re searching desperately to get opening night tickets (like a certain transit blog editor probably is), don’t forget there are at least a dozen transit accessible theaters in L.A., including Arclight Cinemas Hollywood and Culver City, Highland Theater, Laemmle NoHo 7, LA Live Regal and CGV in Koreatown, among others. The most frustrating part about America’s “Car Culture” is that it wasn’t always that way. It used to be that even modest-sized cities, if they covered enough land to make shoeleather impractical as one’s primary means of getting around, had some kind of public transit, and it used to be that our cities, from vast metropolises to tiny hamlets, were laid out in ways that allowed a resident of the city to conduct the overwhelming majority of his or her business by walking, and allowed residents of outlying areas to go into the city once or twice a week (whether by horse-and-buggy, by train, or by automobile), and conduct all of their business on foot or by transit. If you live and work North of the Slot in San Francisco, or almost anywhere within the New York City Limits, or even in parts of Chicago, you still can. And indeed, up until the mid-20th-century, even the characteristic sprawl of Los Angeles was shaped not by the freeway system, but by the routes of the Pacific Electric. There may be some truth to the long-enduring urban legend that the demise of the Red Car was premeditated and intentional, the result of a conspiracy by those who stood to profit from making Southern California utterly dependent upon the automobile. It’s even more saddening to think that our dependency is a result of our own ignorance. We only perpetuate car dependency, because we don’t know any better, at least for the decades of development that resulted in sprawl. I wouldn’t just limit to “Europe.” It’s not like Europe is the only place one has to go to see a glimpse of densely populated walk-able world class cities with excellent mass transit and transit oriented development. You can see that in Asian cities like Tokyo, Osaka, Seoul, Busan, Beijing, Shanghai, Taipei, Hong Kong, Singapore, Bangkok, Kuala Lumpur and Jakarta as well. There are just as many Millennials who also travel to or prefer visiting across the Pacific, with vacations and backpacking through SE Asia, traveling to China, Hong Kong and Taiwan, and visiting Korea (Hallyu, K-drama, K-POP) and Japan (anime, manga, video games), staying at youth hostels and airbnbs. And those who expand their views to see Asia have their eyes opened culturally that not everything that Europe does is always right or correct, that there are other ways of doing things, and that there might be somethings that the US could learn from Asia as well. During the period of the decline and final disappearance of rail transit the the LA area, gasoline was 20 to 25 cents a gallon, and financially challenged Angelenos could buy a usable car for $100 or so, keep it running with inexpensive spare parts and junkyard finds, and when something major failed, look for another clunker. As late as 1972, long after the last trolley lines had quit, one could still buy a serviceable ride for $100 to $200, smog enforcement was still in its early days, and gas was still less than 30 cents a gallon. The business model of the dope peddler comes to mind, get the users hooked on the cheap and then jack up the price. Nothing says that people can’t downgrade from cars to motorcycles and scooters either, which gives one as much freedom of as a car, but a fraction of the cost of owning a car, far better gas mileage, and a lot less space hog. 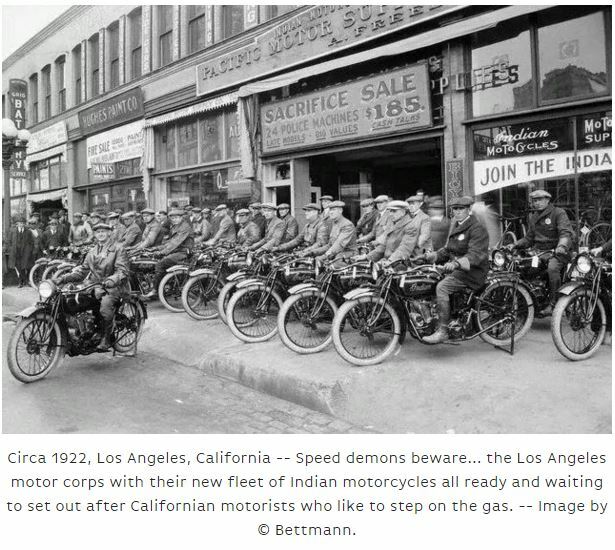 Did you know that before LA was know as automobile land, it was also a major motorcycle city at the turn of the 20th century? 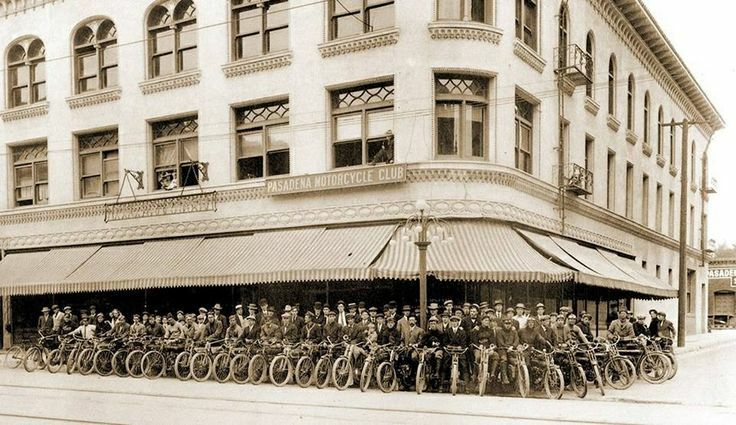 This was when LA still had an excellent multi-modal transit system. 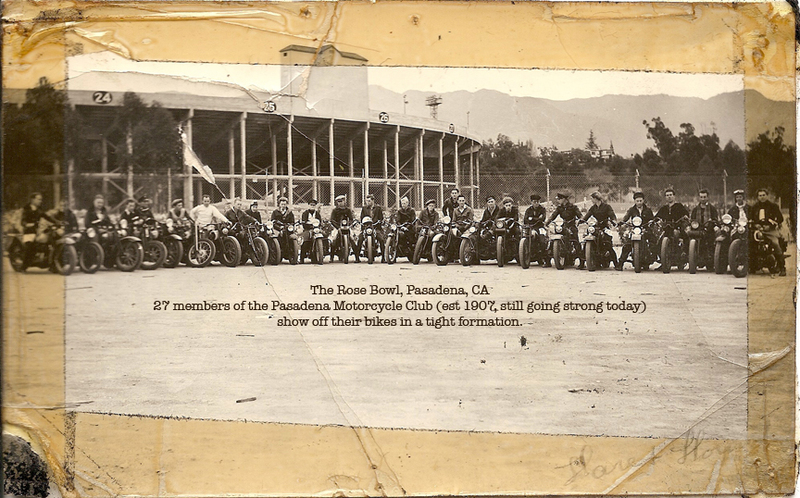 Every year, motorcycle enthusiasts from all over LA come around to Venice Beach to recreate a group shot photo of motorcyclists near the iconic colonnaded buildings on Windward taken back over hundred years ago. 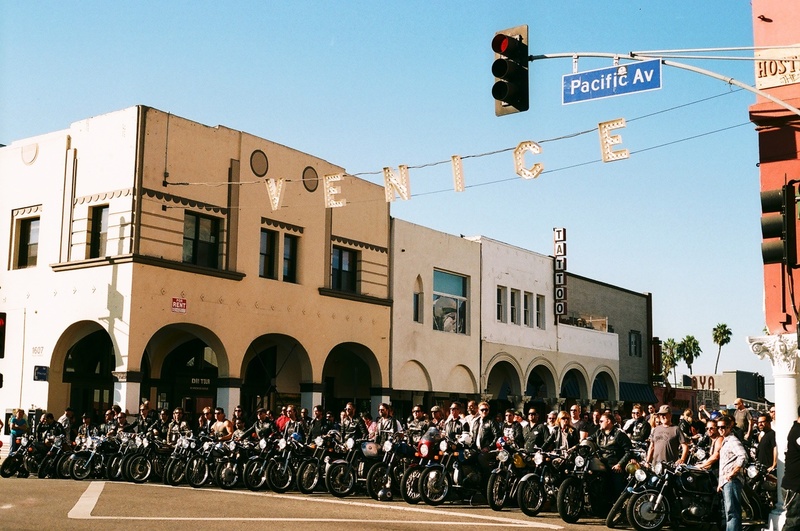 LA should really encourage this event like CicLAvia as it brings in lots of people from all over LA, sometimes from farther away and it really helps the local economy. Only privileged millennials get to travel to Europe and Asia, or can afford to live in the Top 10 “Transit Cities” and write about each other. Talk about stereotyping a whole generation ! What about the large number of suburban and working class millennials ? The millennial generation is driving less because it has a higher number of urban poor than previous generations. They will buy cars and flee the crime-ridden urban neighborhoods of their youth as soon as they can afford it. 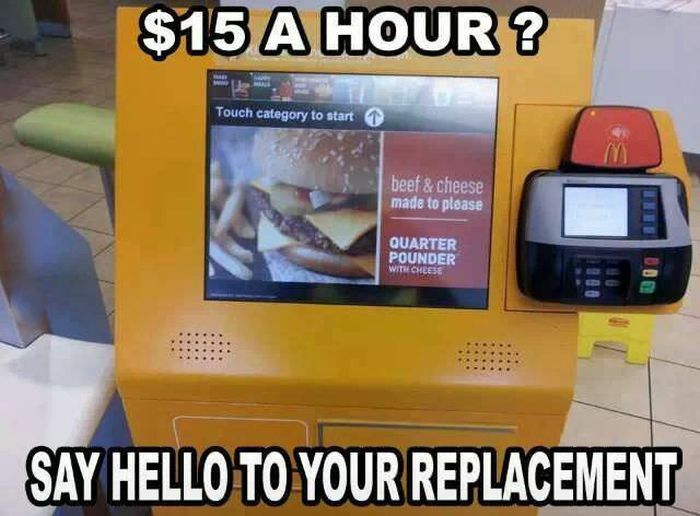 Then it’s up to you Millennials to wake up and stop voting for Democrats. They’re the reason why there are no high paying jobs here and all the factories and manufacturing jobs have left elsewhere and why rents keep increasing and no one can afford to buy a home here because they keep pandering to homeowners and landowners who are against higher density development to increase the supply of the housing market. 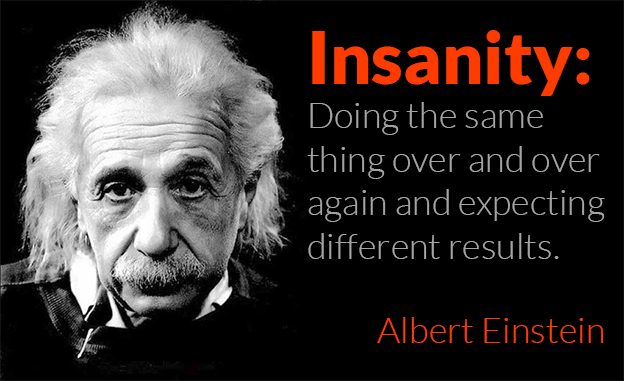 All you do is do the opposite and pretend that government is going to help you. Wake up and realize that the government isn’t your friend, and they’re not out to help you, they’re there to screw you over. And now you’re more poorer because even though the minimum wage is increased, things cost more and there are even fewer jobs to go around, and you end up paying more in rent because not enough housing development is going around.